While we’re on the subject of getting used to failure and letting yourself take shortcuts, I have a confession to make. Growing up as a perfectionist sometimes meant I was a very, very poor sport. In 6th grade, I was determined to accumulate every possible accolade available to me. I tore through novels at a frantic pace to be the top Electronic Bookshelf reader. I drew up posters to campaign for a student council position. I left class each day to run the controls for the entire school’s closed circuit news station. I assisted the computer teacher setting up technology for special events. I wrote columns for the 6th grade newsletter, The Leopard’s Roar. I slaved over every assignment as part of my neverending quest for perfect grades. I practiced endlessly to execute the perfect flip over the monkey bars on the playground. Life was juuuust about perfect. One cool spring morning, though, things changed. I’d been eagerly awaiting an announcement from my teacher, Mrs. McRae. She was looking for a few trustworthy students with integrity and strong academic performance to appoint to the coveted position of safety patrol. Being on the safety patrol would add another shiny pip to my starched, pristine collar, and I was absolutely rabid over it. The morning was packed with independent work. I was absorbed in completing my math worksheet while folks milled about the room attending to their own tasks. At one point, I realized Mrs. McRae was calling out the answers to the worksheet, but since I wasn’t finished, I tuned her out and continued working without much thought. I didn’t think twice about doing so until one of my classmates piped up with a whine, “Mrs. McRae, Julie’s cheating! She’s writing down answers while we’re checking it!” I looked up, shocked. Just to bandage my wounded pride a little (15 years later, because you know, that’s normal), I was not cheating. I was calculating the answer to every problem and hadn’t heard or recorded a single answer that was called out. I was just trying to finish my worksheet, y’all! Nevertheless, Mrs. McRae called me out of the classroom. Confronted with what felt like the greatest injustice I’d ever suffered, I began to have a full-on anxious meltdown. As I restated my case and pleaded with her to believe me, I started crying tears of frustration. Finally, I stormed into the bathroom beside our mobile classroom to flip out in private. A few minutes later, Mrs. McRae followed me. She told me that she didn’t know if I’d cheated or not, but considering the situation, she did not feel it was appropriate to appoint me to safety patrol. Oh my goodness, y’all. Oh my goodness. My little 6th grade life flashed before my eyes. I cried some more in the bathroom. I cried at home that night. I glared daggers at the safety patrol students when I passed them in the hallways in the following weeks. I’d love to say, “And then I got over it!” but here I am writing an entire blog post about it as an adult, so uh. That’s probably kind of unhealthy, right? Whatev. It scarred me, people! But ultimately, even though it was hard to swallow, I can honestly say I appreciate the lesson in dealing with unfairness and disappointment. Getting used to the fact that things don’t always go your way (and sometimes, aren’t even fair!) is part of being a healthy human being. Talking about disappointments is an apt opening to a monkey bread post on Willow Bird Baking. 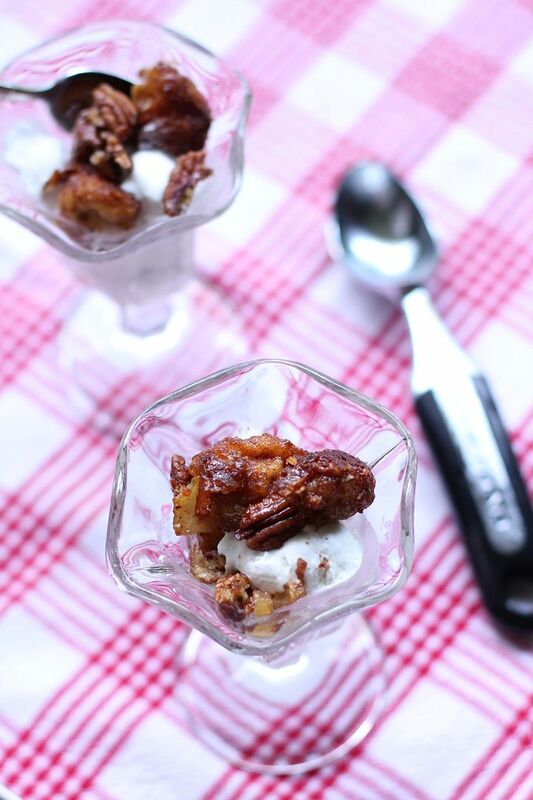 Don’t worry; these Apple Cinnamon Monkey Bread Sundaes aren’t disappointing! They’re gorgeous, rich fall treats. Monkey bread in general, though, has always been a total fail for me. It typically falls apart, overflows its pan, or ends up doughy in the middle. Even when I tried straight up convenience monkey bread with canned biscuit dough I managed to use too many cans and create quite the underbaked mess (stop laughing!) I can’t explain this phenomenon — monkey bread should be so darn easy. What’s the matter with me?! Anyhow, instead of throwing a fit in the bathroom, I’ve kept trying new monkey bread recipes. I love the stuff, so even the “failures” get devoured in short order. 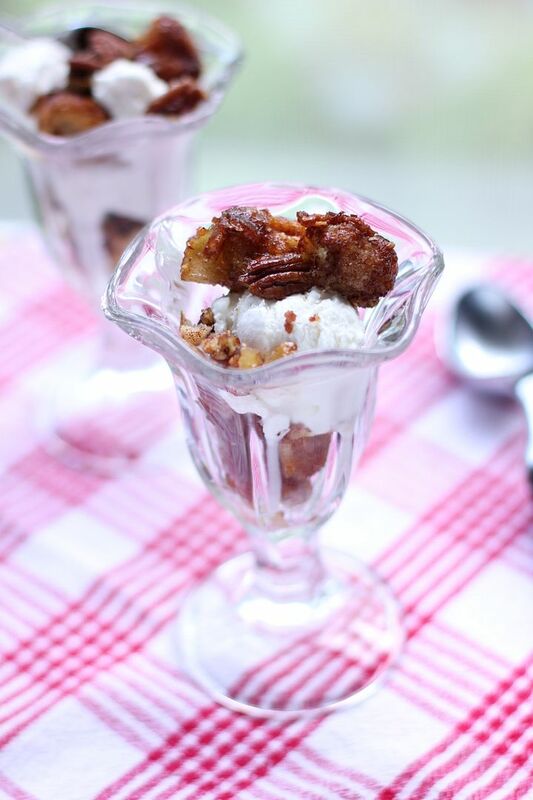 And these Apple Cinnamon Monkey Bread Sundaes were quite the little success. With one batch of yeast dough, you can make some Taco Pockets and a quick dessert — two dishes for the effort of one! The “recipe” that follows outlines this simple method for dressing up your leftovers. Next time you’re making some yeast rolls or dinner pockets, save some dough for monkey bread! What’s an injustice you remember experiencing? 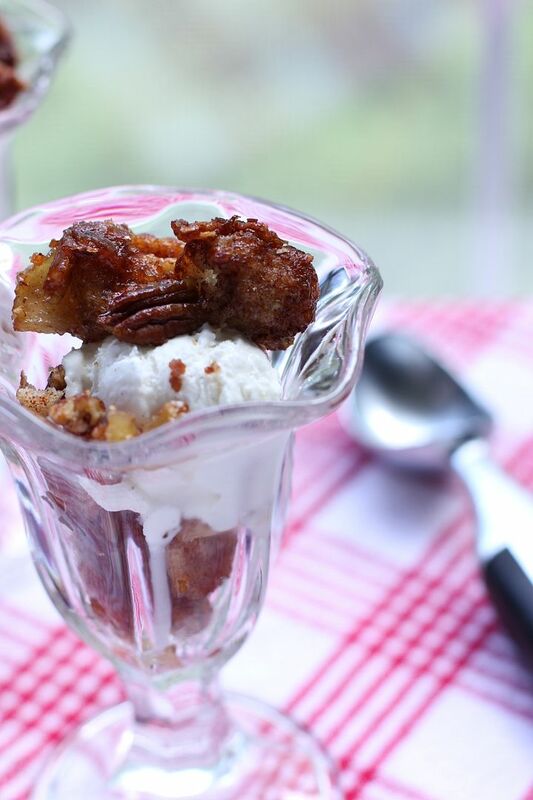 This recipe is actually just a method of dolling up leftover dough to make monkey bread sundaes. Using this little technique, you can save some dough from any dinner recipe and create a dessert to enjoy at the end of the meal with no extra fuss. Even if you only have a small amount of leftover dough, you can bake your monkey bread in the wells of a cupcake pan and serve the warm, gooey pieces over vanilla bean ice cream! –Leftover yeast dough* that has already completed one rise. Maybe you used the first half for some Taco Pockets? You sly devil, you. –Sauce: You can use 1/2 cup (1 stick) melted butter mixed with 1 cup brown sugar to form a caramelly sauce. For more apple flavor, you could also try mixing 1/2 cup butter and 1/2 cup brown sugar over the stove, removing it from heat, and adding 1/2 cup apple butter. –Cinnamon and sugar mixture: 1/2 cup sugar whisked together with 1 1/2 teaspoons cinnamon. –Melted butter: about 1/2 cup. –Nuts: about 1 cup of chopped nuts like pecans or walnuts. I chose pecans because I love them. Set up each of your items in a row to form an assembly line: an apple station, a melted butter station, a cinnamon/sugar station, and then a greased bundt pan (or greased cupcake pan if you only have a bit of leftover dough). Set your sauce and nuts to the side for now. With floured fingers, take a ping-pong-ball-sized pinch of leftover yeast dough (you can change this to smaller pinches if you’re baking in a cupcake pan). First, place some apples in the middle of the ball of dough and pinch the dough closed around them. Then drop the dough ball in melted butter, tossing gently to coat with a fork. Next, drop it in the cinnamon and sugar mixture and toss gently to coat (use a separate fork in this bowl). Drop your coated dough ball in the greased pan. Once you have a single layer covering the bottom of the pan you’re using, spoon a layer of sauce over the dough balls and sprinkle on a layer of nuts. Continue pinching, filling, and coating dough balls to form another layer, and then spoon sauce and sprinkle nuts over this, too. Keep going until you’ve used all your dough. *Note: You can use this technique with canned biscuit dough, too — just cut out the rise time. 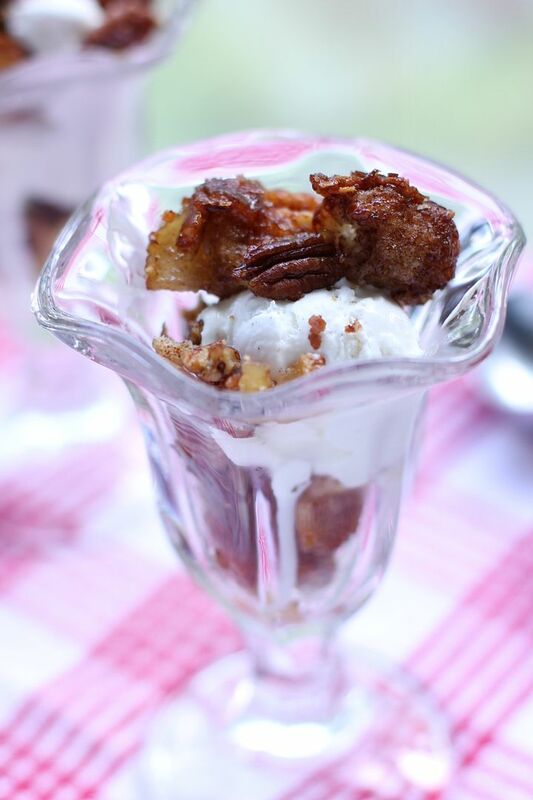 Such a fabulous sundae idea! Delicious!! In 4th grade, we switched classrooms for math everyday, which meant that we were sitting in someone else’s desk for that period. One day, after we swtiched back to our homerooms, I got pulled out of my homeroom and back into the other room, where I was yelled at in front of the whole class. Apparently, the twerp who normally sat there had raised his hand and told the teacher that I had drawn a smiley face on his desk. I was accused in the hallway and denied the drawing. We went inside, and I swear there was no smiley face anywhere on the desk – just the pencil marks you would expect from 30+ years of use by little kids (seriously, the desks still had inkwells!). The teacher seemed even more mad at me that there was nothing on the desk. She acted like it was my fault that that kid tried to get me in trouble and that she didn’t bother to confirm his story! Then she moved me away from my friends to keep it from happening again, instead of moving him. The other kid never even got in trouble for lying! Talk about unfair! I went home and cried and cried, and I still hate math. Aww, the INJUSTICE!! Adrienne, I totally feel your pain, girl. TOTALLY. I love reading your posts, Julie. I can’t think of an injustice right off hand (a thought will probably strike like lightning as I drift off to sleep tonight). I wanted to tell you that the way you described your challenges with monkey bread is exactly how I feel about any recipe that requires whipping egg whites. I guess mastering those are my current trial and tribulation. You will get it, LeAndra! We’ll keep confronting our cooking demons 😉 Wishing you clean metal bowls and voluminous whites! Too freaking cool! I would so make this for company! Yum! I love monkey bread anything. And I have lots of those kinds of scars from childhood too. 🙂 I’m looking forward to meeting you at the Foodbuzz Festival! Can’t wait to met you, Dorothy! I LOVE all the stories you share. I feel so bad, but it’s also super cute 😛 I’m sorry you didn’t get to be on Safety Patrol! hahaha i think you and i would’ve been friends (or perhaps competitive enemies? :)) with similar personalities! too funny! I love your ideas, you’re so creative and AN AMAZING BAKER!!!!!! I especially love the idea of pumpkin cheesecake stuffed snikerdoodles! YUMMY!!! Also when I saw the doughnut .. thing… i don’t think it would be very good but with your amazing baking skills I will totally trust you on this one!